Figure Drawing: Geometrie Practique - The Height & Stature of the Human Body. Geometrie Practique - The Height & Stature of the Human Body. De La Grandeur & stature de tous corps humain. luy reueue, augmentée, & grandement enrichie. pres le collage de Cambray. 1555. 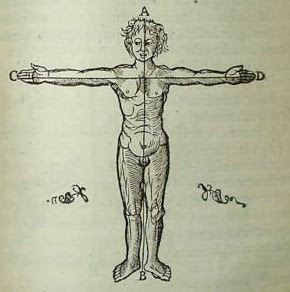 First work on geometry in France included this woodblock print of the proportions of a human body. You can search for a copy yourself at Abebooks.com. Use the search terms "Geometrie practique". Geometrie practique. revue, augmentée & grandement enrichie. das ist hier alles sehr akademisch und naturalistisch, so richtig 19.Jht.